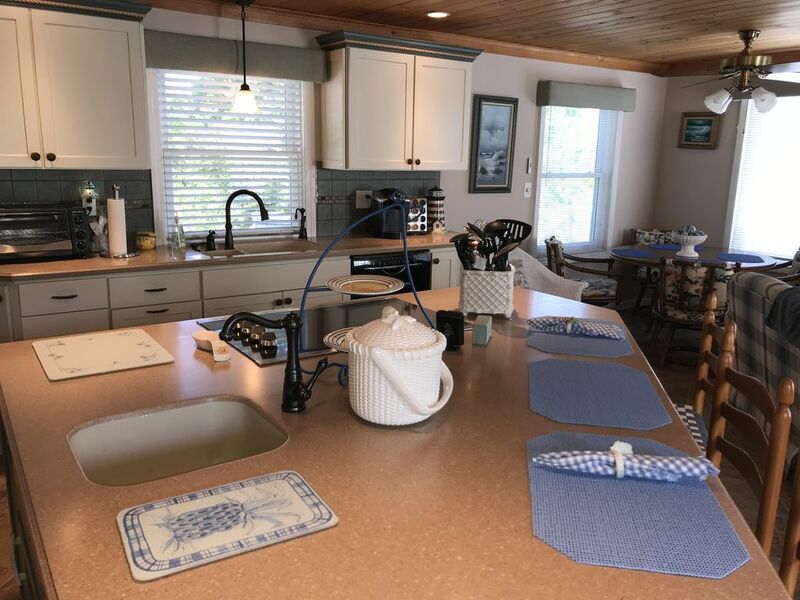 Your family will wake up with amazing views of Long Island sound in an updated cottage with all the comforts and amenities you'll need for a relaxing and memorable vacation. The upstairs bedroom sleeps 4 (a king and two twins) and downstairs bedroom (queen). The living space is open and updated with water views. Two decks (front & side of house)have plenty of seating to relax and enjoy the outdoor space. You are steps away from the private community beach and playground. Perfect get away... with out a long road trip! Everything was beautifully laid-out, very clean and the arena was quiet! The beach was an easy walk, with the nice play scape for kids. And the owners thought of every detail for a easy get away! Our family absolutely loved being here. We felt right at home immediately. It had everything we needed, the space was comfortable and updated...The kitchen had all the amenities we needed and more.The beds were very comfortable, house was over all cozy. Playground and beach area kept everyone laughing and enjoying time together. The owners were amazing and made every effort to make sure we were happy in our stay including a basket of goodies for the children and snacks. We look forward to returning and highly recommend this rental! On a day or two of rain we enjoyed reading , relaxing by the water and watching a lovely thunder and lightening storm. Location of cottage was very close to town. It is fully equipped with many thoughtful inclusions for snacks, coffee and bathroom necessities. The owner was very helpful with all our questions and made us feel welcome . Don’t miss this lovely cottage in a charming waterfront community with a private beach.. A lovely spot to return to in CT. Relaxing and enjoyable vacation stay! This place was comfortable and relaxing with great views of the ocean even from inside the house. There is plenty of room and the front deck was a great place to spend time. Easy walk to swimming and playground and short drive to grocery store and dozens of great restaurants in Stonington and Mystic. Margee does a great job preparing the place for everything you would need for a great vacation. the house was perfectly located 5 minutes from downtown mystic and 5 minutes to old mystic village. there were also several restaurants and a grocery store all within a few minutes of the house. it had great views of the ocean. sitting on the deck looking out on to the water was fabulous. it was located in a private community with it's own private community beach and playground and large field which was great for kids. the owners went above and beyond to make us feel like guests in their home. i was contacted prior to arrival asking if i needed anything in particular for my visit. the owners thought of every little detail in the house. for example, we brought popcorn with us but forgot chip clips. the owners had a basket full. i would without hesitation stay at this house again. we already told family and friends about our stay and they are looking in to possibly booking time there as well. Our family of five was perfectly cozy in this cottage on the ocean. The mornings were beautiful and quiet in this little cottage community. Our host called on our arrival day to make sure we didn't need anything else, and to make sure we got in safely! We spent three nights here, and it was the perfect place for our getaway!